NEW 18" CANON LANYARD I.D. / EVENT PASS HOLDER CLIP KEY CORD NECK STRAP 4 PCS. 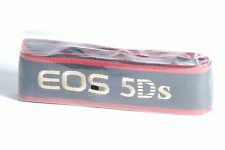 It is a special edition neck strap released to celebrate the 10th anniversary of the EOS 5D. 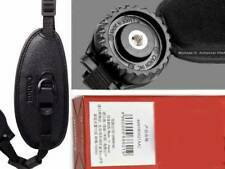 GENUINE CANON EOS NECK STRAP. This is the last batch we have available. Canon 500mm F4 IS USM L 11 and Canon 600mm F4 IS USM L 11 lenses. The Canon 300mm F2.8 IS USM L 11, Canon 400mm F2.8 IS USM L 11. 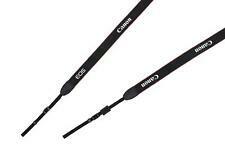 The Canon Lens Wide Strap B is designed to fit. 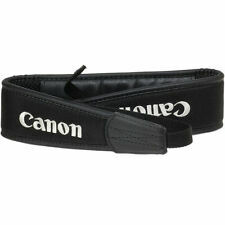 The wide strap is made from a tough, strong fabric and features the white Canon logo. THE BADGE HOLDER WILL ACCOMMODATE A 5" x 7-1/2" CARD, AND THE LANYARD IS 18" IN LENGTH. FOR SALE ARE CANON LANYARDS WITH EVENT ID/PASS HOLDERS! 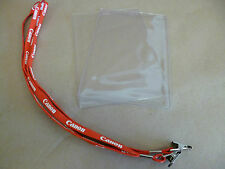 2 CANON LANYARDS. This strap is padded and comfortable. Canon EOS 600D/550D/500D/450D/400D/350D/300D, 1100D/1000D/1500D,Canon EOS 10D, 20D, 30D, 40D, 50D, 60D, 300D, 350D, 400D, 450D, 500D, 550D, 600D, 1000D, 1100D, 1200D, Canon EOS 1D, 1D Mark II, 1D Mark II N, 1D Mark III, 1D Mark IV, 1Ds, 1Ds Mark II, 1Ds, Mark III, 1D X, 5D, 5D Mark II, 5D Mark III,7D, 100D ,650D. Soft model. Made in China. 15/16" Wide. CONDITION:new, still in plastic. This neck strap is in NEW unused condition. The unwrapped version is purely for example purposes. LN "Like New" 99% -100% of NEW. Condition: NEW. • Cash on pickup. EX "Excellent Plus" Exceptionally nice. 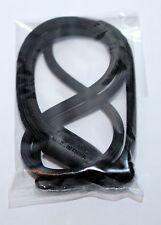 CANON GENUINE VINTAGE NECKSTRAP NEW!!!! UNOPENED!!! STILL SEALED!!!!!!! This neck strap is in NEW unused condition. LN "Like New" 99% -100% of NEW. Condition: NEW. • Cash on pickup. 40" total length. The strap can be adjusted in half to 18 1/2". The removable end parts Made in Hong Kong-. woven by the edge on a jet black background. Industry standard 3/8" webbing connectors. Manufacturer: Canon. I’m currently shooting with a Canon 70D and the strap has 2 red stripes above and below Canon logo and the strap color is black. Colour : Blue and red. Canon EOS 600D / 550D / 500D / 450D / 400D / 350D / 300D, 1000D / 1100D / 1200D / 1300D / 1500D,Canon EOS 10D, 20D, 30D, 40D, 50D, 60D, 300D, 350D, 400D, 450D, 500D, 550D, 600D, 1000D, 1100D, 1200D, Canon EOS 1D, 1D Mark II, 1D Mark II N, 1D Mark III, 1D Mark IV, 1Ds, 1Ds Mark II, 1Ds, Mark III, 1D X, 5D, 5D Mark II, 5D Mark III,7D. Canon EOS 600D/550D/500D/450D/400D/350D/300D, 1100D/1000D/1500D,Canon EOS 10D, 20D, 30D, 40D, 50D, 60D, 300D, 350D, 400D, 450D, 500D, 550D, 600D, 1000D, 1100D, 1200D, Canon EOS 1D, 1D Mark II, 1D Mark II N, 1D Mark III, 1D Mark IV, 1Ds, 1Ds Mark II, 1Ds, Mark III, 1D X, 5D, 5D Mark II, 5D Mark III,7D, 100D ,650D . This neck strap is in NEW unused condition. LN "Like New" 99% -100% of NEW. Condition: NEW. • Cash on pickup. EX "Excellent Plus" Exceptionally nice. Will show minimal signs of wear. This is for a quantity of 1 new strap as I have an extra. Item shown in the photos is the item you will receive. I've described the above item as clearly and thoroughly as I can. 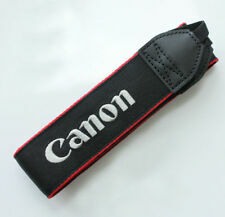 Canon Shoulder Strap. Genuine OEM Canon Strap. The camera in the photo is not included. I accept Paypal payment only, and only ship to Paypal Confirmed address. No APO/FPO/DPO addresses. No international addresses. I am human and can make mistakes, no matter how hard I try not to. I will always work with you to correct any mistake I make. Doing so is against U.S. and international laws. The item pictured is the actual item that you will receive. EOS Rebel T6, EOS Rebel T5i, EOS Rebel T5, EOS Rebel T3i, EOS Rebel T3, EOS M3 etc. FITS EOS T1, T3, T3i, T5i, T6, EOS M3. 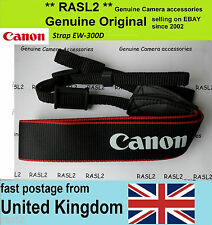 Fit CANON DSLR EOS REBEL MODEL New Genuine Canon Neck Strap Approx. 1.19" width. This neck strap is in NEW unused condition. The unwrapped version is purely for example purposes. LN "Like New" 99% -100% of NEW. Condition: NEW. BGN "Bargain" Shows more than average wear. May have stains, discoloration or fraying but no holes or tears. CANON 35mm F1 THIN STRAP w/RUBBER SHOULDER PAD. NEW, ORIGINAL, GENUINE. Local pick-up is available. 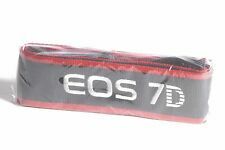 CANON EOS 7D CAMERA NECK STRAP - GENUINE, NEW!! I opened plastic Bag to photograph the grip. Hand grip for EOS 600, 620, 630 and 650 film bodies.